The word is out—adding text to quilts is IN! Share a sentiment, stitch an inspiring statement, or create cute and quirky messages in fabric with Text It! Use the letters, numbers, and symbols of SEVEN different fonts, provided on pullout pattern sheets, to create 10 quilt and pillow patterns as shown in the book. Or personalize projects with one-of-a-kind wordplay! Example of the seven fun fonts in Text It! From clever catchphrases to sayings that are good for the soul, Text It! will help you choose just the right words to convey your thoughts in fabric—as we quilters love to do. I grew up in New England, the youngest of four children. My mother wasn’t a quilter, but lucky for me, we did have a sewing machine in our home. I was also fortunate enough to have a presence of both of my industrious grandmothers in my life; painting, sewing, and knitting were collectively their creative passions. I didn’t realize until later in life how much creativity surrounded me in my youth or how my family influenced me. Not only in their creative endeavors, but in their loving and fun, cheeky ways. That’s why my designs almost always center on my love of family, silliness, or positive persuasion. My own quilting endeavors began in college. I had friends that were sewing and it became a creative outlet and a way to express myself. One day I realized that each quilt I made had an intention or a message for the recipient. I didn’t sew only for fun; it was also my way of expressing myself and my love for the recipient. While I stitched away, I would focus on the person who would receive the quilt with a message I wanted to convey—sometimes loving, sometimes silly, but always with a positive spin. While I had lots of fun making all the projects in Text It!, I do have my favorites. The Freedom quilt probably holds the most meaning to me. 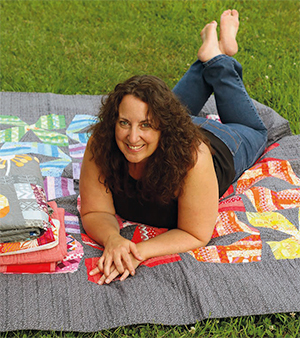 I can’t wait to share Tara’s Freedom project with you, along with all the projects remade by some of your favorite quilters! Get a copy of Text It! and gather your silly sayings and your powerful messages. Mark your calendars and get ready to share your creativity. I’ll be hosting a fun blog hop that kicks off March 4 at my website, Rebecca Mae Designs. Thanks for introducing us to your fun new book, Sherri! What would you “write” on your first Text It! quilt? We’ll choose a random winner one week from today and let you know by email if you win. Good luck! 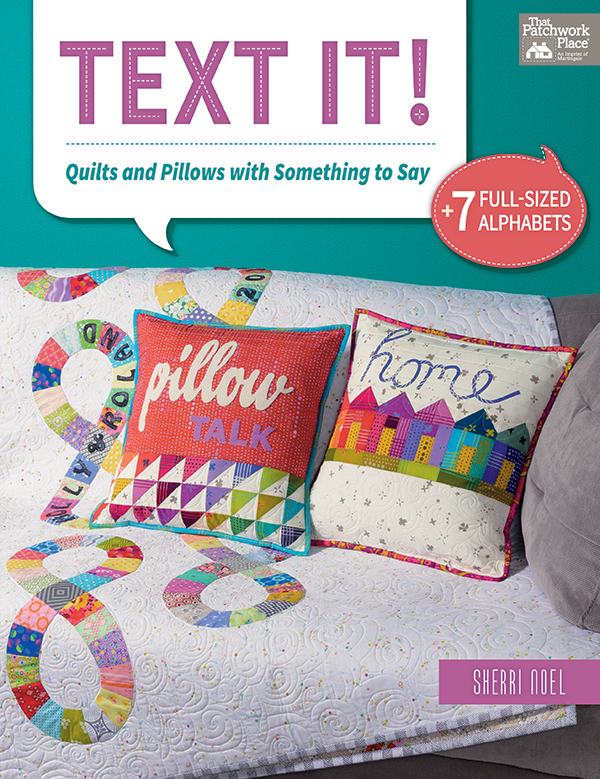 And if you’re ready to start texting on your quilts right now, you can purchase Text It! at our website, ShopMartingale. We’ll email you about your prize, Theresa—congratulations! I would do “Laugh Out Loud” to remind me not to take life so seriously! I would use it for a church banner with the words "Believe the good news." Pillow or wall hanging "Home is my happy place"
I think my first word would be "Hope." It is always a positive word. My first text would be a wall hanging for my door saying "Welcome". This book looks like it is full of great ideas! I have a birthday card from a significant birthday that I always thought would make a great quilt! I know it has been said before but I would use the phrase…I TRIED NORMAL, I DIDN’T LIKE IT. I am really excited about this new book. Thank you! i have a pattern in mind for a friend who’s husband is terminal and have been trying to find a way to write on it so this would be fantastic! My first text words would be "GO MISTY" because my best dog friend, Misty, and I run dog agility together and have the best time. My first text project would be a pillow with "Life’s short, eat chocolate." My first text would say "breathe." Looks like a great book. I would add the favorite animals of my 2 1/2 year old granddaughter; turtle, baby shark, elefun, so forth. I would love to see this book. My first text would be a pillow gift with the words "Thanks for being YOU"
I would write Love because all of my quilts are made with Love. I would make a baby quilt saying "I Love Shelby" for my grand daughter. Finally, a source for fonts I’d like to use! First use: name of grandchild on quilt I’m making for her. Love it! My first quilty text will be "compassion". I just had my first grandchild. I think I would make a quilt with his name on it: Oliver! Love this quilt idea! I will make a quilt for my granddaughter’s name. She’s arriving in mid June! Not sure what her name will be yet. Just started learning to do sayings on my quilts and bags. This book would be a great resource in my learning to do sayings! I like writing text on quilts. I did "I Love You to the Moon and Back for both my grandchildren. I love doing word applique. I think I maybe would do a bench pillow. I have several of these and my grandkids just love them. I would maybe say "Family is Everything". The first thing that comes to mind for me is a quilt for my now at college son — I’d make him a quilt with the sayings/words/chants from his school. Gig ‘Em! I’d probably practice with a "BTHO" finals tote bag, wall hanging, something-or-other to cheer him up at the end of this first semester of his. I’d just keep going from there, though; these are great ideas! And like Rebecca, all my quilts have messages in them….now I can help make that message more visible/obvious! I would write the name of the baby for whom I’m making a quilt! Lately I’ve been embroidering song lyrics special to new parents on simple baby quilts. These fonts would be more impactful in the design. My first text quilt, like all my first of any type quilt would be for my daughter(who since she was about 6 has tried to claim nearly every quilt I have made), it would say "horsewoman!" This is great. I think I would write "Lucky" because that is my cat’s name. My kitty deserves a cute quilt! I’ve been wanting to do small wallhangings for some special friends so think this would be perfect – FRIENDS. Or maybe QUILT. I would add the word "Believe" on a pillow cover to remind me that God is always present and fills my days with blessings! I would make personalized placemats for my 2 granddaughters! I’d start with a "Welcome" banner near the front entrance to my home. I have added a child’s name to a quilt many times. I would probably make a pillow as a gift for granddaughter and future husband with a heart and their names inside the heart. I like putting words on things, but up until now usually hand embroider on my gifts. Would probably write I Love You. Would love to have the applique book for letters. I live this idea, my first would be a wallhanging with the grandkids names. NAMES!! I have this book on my wish list. I think that I would use "Just Do It!" Not because of the Nike slogan but as a way to encourage me to quit overthinking things and not worry about them being perfect. My first pillow would say, Live Life 4 Me! “NO FEAR” with a giant seam ripper! I LOVE words on quilts! My choice of words for my quilt would be Cuddle Up. Planning to add this book to my collection. I am fairly new to texting, and I have never put text on my quilts as of yet. I believe my first project would be Love You Always for my three grandchildren. Love would also be a word I would put in my donation quilts in the hope that the recipient would always feel loved. I have added some words to like a mug rug. I would probably do a pillow. I would use the word "love". Learn. I would love to start with 1 Sheep. Hi, there. I would make a civil war quilt and write "vintage" on it. i would make a wall quilt for my quilt room saying,"cut, sew, quilt". I have no idea what I’d put on a text quilt. That will take some thought. I just know it has to be funny. I’ve never done text on a quilt, but I think the first things I would put would be "Love" and "Family" because that is what is important to me and my children and grandchildren. Next would come "Freedom" for the military men in my family. Boy, I’m going to be busy! I would text "Motor Girls" and make a wall hanging to send to my best friend of 52+ years. She now lives in a nursing home, but when we were youngsters, we did a lot of traveling together and that is what we called ourselves. I would text Sweetpea which is what I call my granddaughter. I appliqued “Molly” on my granddog’s sleeping mat. She then proceeded to chew the corner off the mat. That earned her a puppy shaming picture. My first word applique would be "Love Life!" "Merry Christmas" because I have a Christmas quilt in my future! I’m keeping a list of positive words such as fun, laugh, joy to put on a charity quilt. "Thank you GOD for today"
Wow – how to choose??! I’m picturing a quilt for each of the babies in our family, one for my mom, my sister… Maybe the first quilt will just say "Love"
Love the lyrics to Wonderful World…I would definitely choose a phrase from that great song. This book looks amazing!! The first thing I thought of was, "You are loved." I just love the 1 Sheep quilt and the 8 quilt. I would put my granddaughter’s names on the quilts! Mother needs some seasonal minis to decorate her door in the facility where she is living out her last years. So: Winter, Spring, Summer, and Fall. I think my first text would be LOVE because it is the greatest gift you can give to anyone. Mine would say ‘Thanks’ to a veteran. "FAILURE is a LEARNING experience!" Thanks for all of your fantastic books! When our first baby was stillborn, my father-in-law sent flowers with the message, "Have courage." That was 40 years ago, but that phrase still resonates with me, especially when I give thanks for our two healthy sons. I make lap quilts for the Cancer Agency, for patients who are chilled when having chemo, and I write that message, "Have courage" on the label for each quilt. If I received this book, that’s the phrase I would write on quilts. "Thrive" would be the word I would choose. It’s my word for 2019! A quilt is a wonderful gift, but what a wonderful way to express your feelings in words! I put scripture on all my quilts by using cursive in my quilting, but you can’t see it until you look closely. Adding applique words will add just another special touch of love. We’ve been waiting for a long time for a grandchild and we have a granddaughter coming in July. I would do one that says "Welcome to our world!" Simplify, my word of the year. But there are so many wonderful ideas in this book. And I am intrigued by the idea of nickname quilts for each of my grandchildren for their birthdays. I love the idea of adding words to my quilts. I would add “giggle” as the word just makes me smile. Love to Cleo and Daisy who were my favorite kitties. I have two very precious grandbabies so I would write Grandma loves you! This book looks like such fun! I would write "happy skier" for my champion grandson. My personal word for 2019 is "joy". So either joy or joyful would be my pick. The name of my town on a quilt for our charity auction. I would do something for a grandchild with their name on it. "And Sew She Did" 🙂 Thank You for the chance to win a copy of the book! Ohh, I would love this book. My first project would be a banner for my sewing room. It would say, "Quilting is my Happy Place." What a cute book! I would write a Bible verse on a pillow or small wall hanging. Faith moves mountains! Good luck everyone. Thank you for the chance to win. I would put “RESCUE” on mine. I am currently making a quilt that is to benefit our local animal shelter. If I were to put text on a quilt… so many possibilities… but I think it might be something like ‘I am worth it’… we always forget with we are worth. I would text "hello" then the name. I would write "I LOVE YOU". Guess I am in a Valentine mood. I love to make personalized baby quilts — but it’s been a while. Adding text is something I’ve often thought about but have never tried. I think I’d make a little pillow for my guest room that would say "Dream Sweet". My son is thinking of joining the Air Force so something like "America", "Freedom" or "Service". I would use the words "you are loved." Remember to be truthful and kind. I think I would practice with these fabulous fonts and make something for me (which I never do) that says when life gives you scraps, make quilts! "hold your caballos! ", this is a saying my mom always used. My first word would be "Read!" My guild is always making community quilts for our local pre-schools for special needs students, and send along a book with each quilt. I’d make a quilt for a family member and it would say “I SKI”. I would love to write, "I am the Good Shepherd." and make one of those sheep that is pictured with the baby. "Friends forever" would be what I would start with for sayings. I belong to a group of friends who enjoy making things to share. That would be perfect for me. 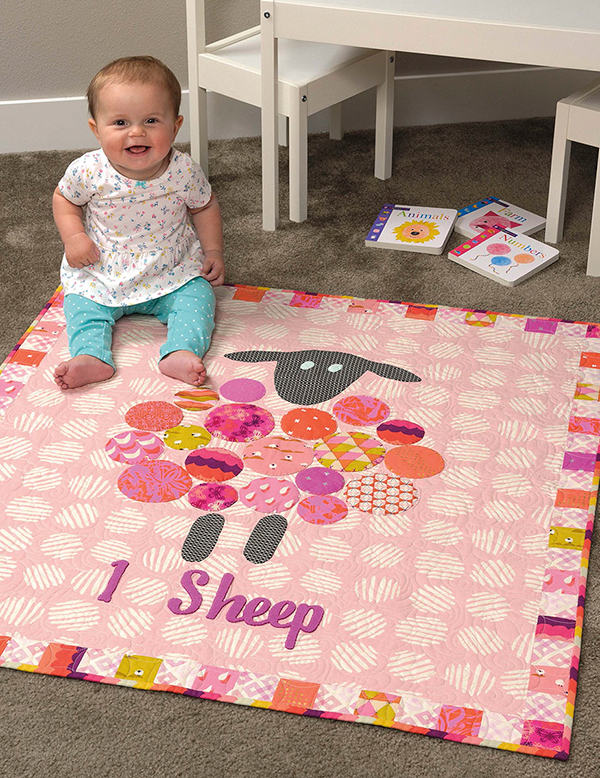 I really love the 1 sheep quilt too….that is definitely on my list! Simplify – but there are so many more! So many words or sentiments that could be put on a wall quilt or pillow. Your imagination could go wild on these. I would love to have a copy of this book. I would like to do personalized baby quilts but I am never happy with the way the lettering looks! This book looks like it might have a solution!. I would use "Go for It!" Believe in You will be my first "Text It"
I probably start with someone’s name or a short phrase, perhaps on a Christmas pillow. And then I would work my way up to a larger project. I’m planning to make seasonal bench pillow covers so I would start with "SPRING". I love, love, love this book! I would make 5 pillows – one for each of my grandchildren with their name on it….and then start on Christmas gifts for friends! I love making personalized gifts! I think I would do Home. I love the example with the houses. My first project would be “ Runs with Scissors “ made into a wall hanging for my sewing room! I have a notebook of sayings I love and fabric with words is a favorite of mine too. This looks like a book with great ideas. I would write inspirational words all over the quilt randomly. Believe, Faith, Love, Soar, etc. What a great book. So many choices and ideas. I have a coffee bar, so my first one would have to be coffee related. So many ideas. I should love to put a grandhild’s name on her quilt. 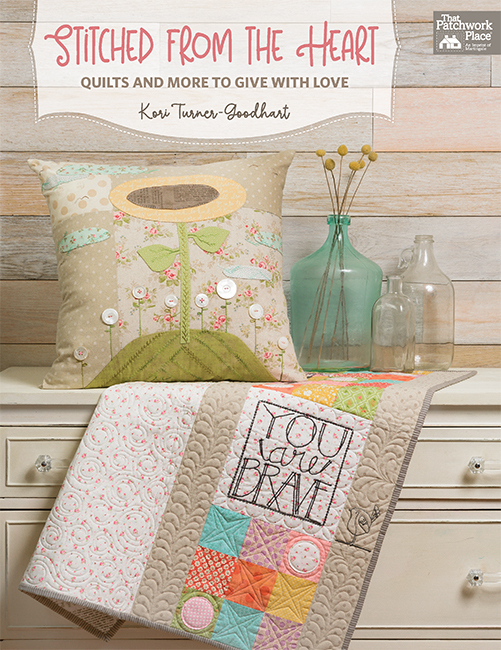 What a wonderful book, super inspirational for happy quilting. At this time of the year I would write, “I Love You”. I love reading everyone’s responses! I think the first thing I would write would be CREATE! "Be Happy" This book looks so good! letters in my quilts. Lovely letters!! Way too many things come to mind. It would probably be a Biblical scripture. I’d write Love You Forever. I would write Food is Our Friend and do something around healthy food. I’m a dietitian quilter and this would be fun to have in my office. Me and a friend are monogramming towels for orphanage in Honduras. Texting names on towels would be cute as pie. We have twenty to do. My niece is having her first baby in May, so I’m making a quilt. I would put the baby’s name on it, if I knew the way to appliqué/make letters. I would write “Choose Happy”. Any other choice just will not do! I would add the word family to an Applique wall hanging. This, too, shall pass… having a hard time with circumstances and need to remind myself they aren’t forever! "Choose Life!" as a reminder that I need to stand up to what I believe! I might put "Love" on a wall hanging. I also like the idea others have posted about putting names of grandchildren on items. I am interested in the different fonts. "Love" — I think that says everything. Thanks for this opportunity. I love this saying, I think I will be happy today! that is what I would put! I have 2 dogs I rescued from a shelter that are my best friends. I believe " A House is not a Home without a Dog" and I would put that sentiment on a lap quilt for us to snuggle up on. #quiltinginmtbasement would be my Text Quilt. I love adding text to quilts. I have put words on a number of my quilts and love doing so to give inspiration. My next one will probably be grow! My mom’s favorite saying – "Grab An Oar"
My favorite: "Choose to be Happy". Now this book is on my wish list! I would first do "JOY" – my word for this year. My first phrase would be "In the Moment." This is so timely. I want to make a quilt for my little grandson, and write his name on the quilt. I have truck fabric all ready, just need a plan to make it happen. I would text the word FAMILY on a pillow! This looks like a must have book! I would text the name of the grandchild I was making the project. What a cute book! I’m having a hard time deciding, but I think I would use the word Beach. Thanks for the opportunity! I would make a wall hanging to match the quilt my hubby is making for our bed with the word "sleep". I would probably use the word LOVE on a pillow. Great ideas! I would personalize a quilt in all of my grandchildren’s names. There is currently nine of them. Live Laugh Love on a wall hanging. My newest Grandbaby’s name – I don’t know it quite yest but will at the end of April. 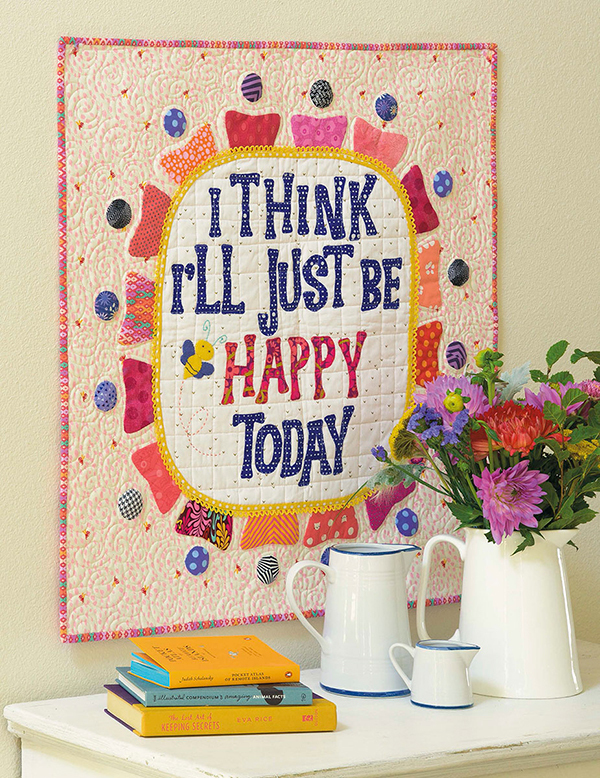 I would really like to make a version of your "I think I’ll Just Be Happy Today" wall hanging! I would also personalize future baby quilts and on and on and on! Looks like a great book! I’m going to sign up for your blog, too. I love making baby quilts so I would make one that said "baby love". I’m into making baby quilts now, and I would write "Welcome Little One." I would write “home” because we are getting settled I our new home! VOTE! It is my duty! I have a quilt with lots of snowflakes on it. I would say "Happy Snow Day" and give it to my daughter-in-law who is a teacher. Only quit the bad stuff. These texts would add so much to my quilts! Pick me…pick me! I’d put “life is a bowl of cherries “ on my wall quilt. The words I would put on would be: WELL-BEHAVED WOMEN RARELY MAKE HISTORY"
I would put the following on my quilt: "SHE PERSISTED". I have a cat named Lucky and I put his name on everything. I would write Big Hug! This book is sure to spark so many creative projects. I would do a wall quilt to say "Happy Birthday". Our family celebrates several birthdays and this would be great to hang up each time we had their celebrations. This is a great idea!! I think I would start with the Name of the person I am making the quilt for. Camel Love….our family collects camels and this would be perfect! I would make a pillow with lovely script of LOVE with a double meaning. I would give this to my husband to show that I love him, but also that I love Quilting!! I would say "It takes courage to create." "You Have Arrived" I love words on quilts. Can’t wait to get started. Mine would be, "Live Life with Gratitude". I would write the names of my two grandchildren on a wall hanging for their room. I would use the book in making banners for our church. redeemed or rejoice might be the first words I would use. I love the Think I’ll just be happy! Thanks for the give away!! My first words will be from my favorite scripture verse, "I can do all things through Christ who strengthens me". I would text "Freedom is not Free". I would use it to put text on the back of the quilt, for my sister, and xoxox. Im making it for her 30th birthday! I would make a pillow that says "Welcome". I would put my best friends names. I would put "Good things come to those who bait" on the quilt that has appliques of a creel, flying fishing rods and lures that I am making for my brother-in-law. Would love to use this book! Thanks for offering the giveaway. I love the projects. It will be hard to decide which one to make first. I think my first text it Quilt would say Be Happy. I love the home pillow. I think that would be my first. I would have it say I love you, I send that text everyday to my husband at work. FOCUS…as in one thing at a time! Would love to win "Text It". Where do I begin? There are so many words floating through my mind right now what I can’t come up with just one. Besides quilts, this would be cute on fabric cards. My text will be: I’m yours! So many words! I think I would start with Dream Big. I would put "Och aye!" On my quilt. It’s a Scottish phrase, and my husband is Scottish. Jesus. He is the reason I can do the things I do. I would put “love you always” on a baby quilt. "Today I am BLESSED" – great book. Just learned my grandson Cameron was born today! I would quilt “Thankful and Blessed”! P.S. would love to see Carol (who’d lost a child) win a quilt book. God bless you and your family, Carol. Freedom! That word is so important these days and I love the quilt. I think I would choose: Choose to be happy! I would do the old standard…….. I would put my grandson’s name, Jackson, on a pillow. Hard to pick which quilt I would make first but definitely would make the sheep baby quilt with the words "Sheep Time". I would have to echo those above who said their first word would be "Love." that encompasses it all. Probably "Unicorn" for my daughter. I would make quilts for my grandchildren with "Love you to the moon & back"
I would make a pillow with the word LOVE. My first project will be a wallhanging that reads "Be Intentional." This looks like a wonderfully inspirational book. I would put Summer ona pillow. There are so many possibilities with this! I would use "Seek Joy" first, and have dozens more stirring in my head. What fun I could have with this book ! "Cite Your Sources" a shorter version of my personal motto: "He who cites his sources brings deliverance to the people". It’s from the commentary on the Book of Esther. It’s a good rule for a librarian. I think I would start with "You had me at WOOF", with a paw print, on a pillow. The thoughts expressed on the freedom quilt really "speak" to me, but I think I would do "I Love You!" on my first text project. Peace and love are all you need. I would put SMILE on a pillow. The "I’ll be happy today" wall hanging. It would be fun to make something for Easter, like chicks peeping. I’ve been imagining a quilt with my grandchildren’s names arranged in a crossword puzzle. The one prayer that reminds me who is in control and keeps me from worrying…”Thy will be done”. I would add “live, laugh, love “ to a quilt. I quilted Sherri’s Dear Daughter quilt for my daughter. It was so much fun to create. Love the idea of you new Text It! book! It would be wonderful to have different types of letters available to spell out ‘home’, ‘family’, ‘love’, ‘faith’, ‘friend’, ‘quilter’, ‘sew sew’. etc. “She said YES” … a friend is getting married. I’d make a pillow with ‘So many books, so little time’. Love the sheep quilt and the different fonts for Letters! Everyone writing so many wonderful things and words, so very positive and uplifting just to read them! I think it would be a great thing to become more proficient at appliqueing letters on a quilt. I think something like "be kind" or "choose kindness" would be a great thing to put on a quilt, maybe as a reminder of how important it is to be kind! Thank you. Fun. I’m not sure what I would write. Maybe something for a wall hanging, or on my studio door. "Enough" as in I AM ENOUGH – a phrase I have to chant some days. Twin toddler boys can do that to a gal! Nel prossimo quilt mi piacerebbe scrivere "Dream"
Translation: In my next quilt I’d like to write "Dream"
My daughter is a teacher at a local primary school. I would include encouraging words on the cushions I am making for her class of 8 to 9 year olds as well as letters and numbers. Life is Wonderful…….I love all the positive sayings that I see everywhere and what better way to say them than on a beautiful quilt! How about “Always Remember…Grandma Loves You!” My grandchildren live very far away. Thanks for the chance to win. I would probably write: "Sew what"
As I go through my day I always remember to "Keep looking up" and he will take care of you. This kind of reminder across the top of a small wall hanging would be a great idea. I would write GEMMA LOU because that is the name of my very first grandbaby! I’ve been looking for or a book like this for years. The first project I would make would say “Choose Happy”. "Today is a good day to be happy 😊 "
Home Sweet Home. Thanks for the chance to win your new book. When life gives you lemons … make quilts! I think this book would be a great addition to my library. I love the different fonts. It would give me a variety to work with. I would write "Live Life, not Work Life" to remind me to not put work first. I’m torn between something long "It’s supposed to look like that" and a short, expressive "Oh Fudge"! I might settle for @&%*!! I think the first thing I would do is a wall hanging that says Martinez for our entry. I would use the word "BELIEVE"—in ourselves, in the good in the world amid the chaos, in possibility for change, in hope that we grow in faith and trust of each other and a higher power! Believing in more beyond ourselves sets us free and empowers each of us! I run a Kids Op Shop staffed only by volunteers. We make bags to give to customers (some customers give us a donation) and if I was selected I would appliqué "Kids OP Shop" on the bags- at the moment we use a stencil and it’s pretty bland!! Love this idea as the book makes the alphabet so accessible. I would use the word Rogue. It keeps coming up in conversations and even the things I buy wind up having that word on it somehow. I think I’ll just be happy today. What a great way to start everyday. My first Text It project would be a wall hanging simply saying.."Enough"
I’d write Bloom – a foretaste of spring and a reminder to be positive. I would write, Ella Mackensie, my grandaugter’s name on a quilt I plan to make her. Love this book!!! It never hurts to be kind. I’d write a quote from "The Voyage of the Dawn Treader", part of The Chronicles of Narnia, by C.S. Lewis. Aslan said this to Lucy. "Thankful" would be my first text word and I’d put it on a couch pillow. 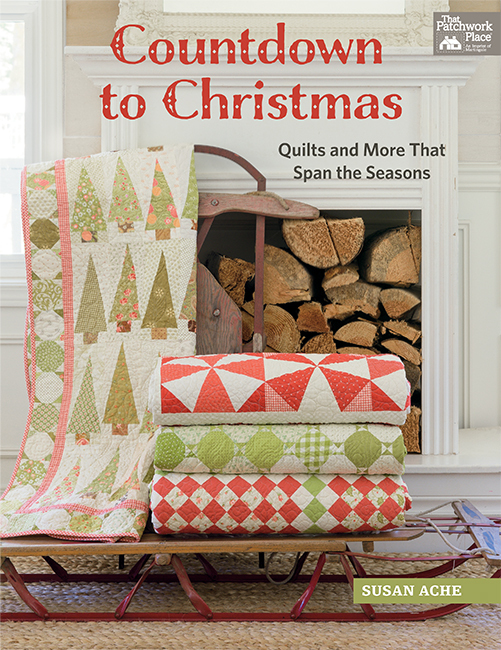 being a big fan of Sherries dear daughter quilt, I would love this book to pieces! I think my first word would be Frolic! I would make a wall hanging, “Sew Happy Today”. Thanks! …the name of a great-nephew expected to join the family in July. I would write my newest Great-Granddaughter’s name, Blair! I would stitch "God Bless"
Morning "text" to sister across the country, different time zone – "Are you up?" That would be a gifty pillow and quilt for her! Thanks for the book preview and giveaway! I’d use my granddaughter’s name on a pillow. I would a make pillows to give for an upcoming wedding that say “Mr & Mrs”. This book is different, great book. ‘No grit, no pearl’ on a pillow or mini quilt. Great book .. Love it~!! I put kids names on baby quilts frequently and different phrases on my postcards. I think tho for myself it would be "It is well with my soul". Thanks for the giveaway! 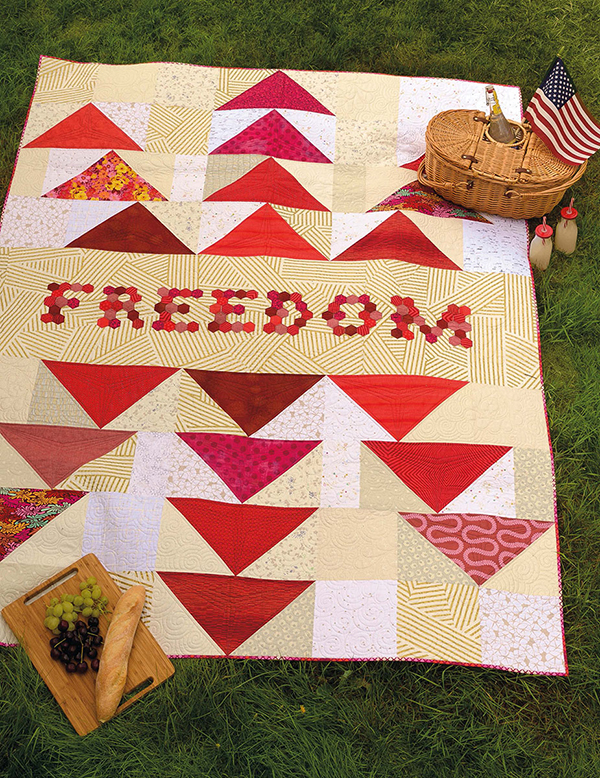 My take of the freedom quilt is "Freedom = America" So, I would like to incorporate that into a Quilts of Valor quilt. I do Christmas stockings for the family and having a set text for them would be wonderful. I also do other small items with text and painting like mug rugs. You only have one life, enjoy it. I really like this idea of expression and the freedom quilt said it all. I would make a wall quilt with ‘I did it my way’ on it. I do a fair amount of Quilts of Valor so would choose words like Freedom or Thank You to put on one of them. I would make a wall hanging with "Choose To Be Happy". What a fun book and ideas. I would put my three year old grandson’s name on his "I spy" blanket. I think I would do "You are my sunshine." I have never used text on a pillow or quilt, but my first words would be Hope, as we hope for better health for a child. Love the idea of this book! I would applique "love" or "cozy". I love the idea of adding a fun or inspirational phrase to a quilt once it is designed. I would have to decide at that point what I would use. What great fun – I love sayings that make you think and this would be a great way to do so. The name of my house "Boxwood Manor!" One of my guilds makes quilts for foster children, especially large enough for teens… so I’d add words that would be up lifting to a teen, providing an emotional hug… "BE BRAVE!!" or maybe "IT’S WORTH IT !!!" I think I would add names to a baby quilt or other text to larger quilts. Thanks. I would like to make the pillow that says HOME on it. Also one that says FRIENDS. I would it to say "Today will be SEW great". I would text "Scatter Kindness"
These ladies posting responses are way more creative than I am! That’s why I need a book! Home Sweet home my quilt world. I want to make the “just be happy” quilt. It is wonderful! There are so many words I could use! Perhaps maybe, EST 1989. I’m expecting a great-grand baby later this year. I’d put his or her name, or an inspiring quote chosen by the new mom and dad. A pillow with "Love x Infinity" (in honor of my granddaughter). I would write, "Keep The Faith" whichis a favorite family saying and reminder. I would make the wall hanging , "I think I’ll just be happy today." I’d probably write my next great grandson’s name on a quilt. I would make a house quilt with "As for me and my house we will serve the Lord." "Hugs" on a child’s quilt I will make to donate to a charitable group. I would text "LOL" because it makes me smile. Thanks for the giveaway!! Mine would say "Welcome to Hill House", my nickname for our guest house. I might make 4 small quilts, each with the name of a season. These would be wall hangings to herald the particular season. I would like to finish a quilt of houses with the name pf the town I grew up in. I would text "Be Happy" on a wall hanging for my grandchildren. I would use the word "READ" on a pillow and make one for me and one for my sister. It would be a reminder for both of us that we share the love of a good book. LOVE 2 Quilt! Maybe on a pillow or just on a small hanging in my sewing room. This book comes at a perfect time. I want to add text to my hand dyed wool pillows. My first words…..
Love this book – can’t wait to have it in my quilting library! I would make a pillow or throw quilt with ‘Angel’ because my daughter is in heaven. quilts would be for my grandson and it would be I LOVE YOU. "Love Always" on a wall hanging! My quilting group and I make charity quilts for kids, so I’d keep it generic, like: Love. My first text would be — Sweet Nothings! Thank you for the opportunity to win this book to add to my quilting library. 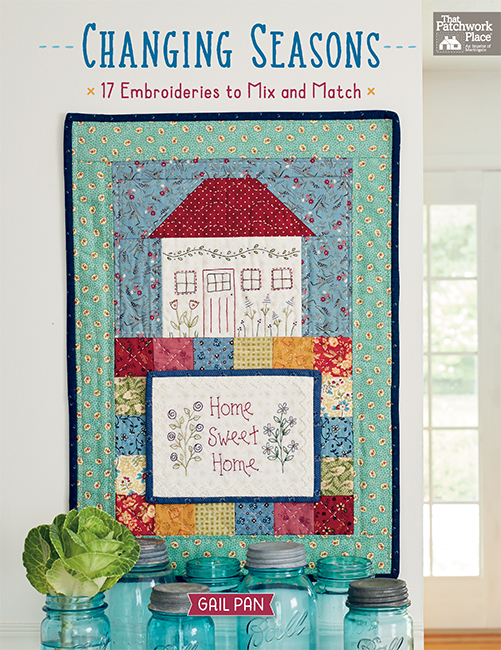 I would love to have a little wall hanging that says CREATE to hang in my sewing room. My idea is to make a quilt with my family’s names done in crossword puzzle style. I think I would do something that looks whimsical and says "quilting is my jam"
Hmmm….. I think I would do something for my sewing room, SEW,or CREATIVE, maybe HAPPY. "Tall Pines, Small Birds, My Home and Haven"
FAMILY would be a good word to write! I think I’d like to have a pillow that says “Relax” for my guest bedroom. It would be my new great-niece’s name on her quilt in July after she is born! I would like to add names to the baby quilts I make. "Joseph Nicholas" would be the first one. I would make a large a wall hanging with the fruit of the spirit scripture. It would be very colorful with fruits around the edge. God ever present I would love this book it seams to have a lot of great ideas. Thank you so much! I’ve been wanting to make a word quilt for a long time, featuring a favorite scripture or inspirational quote, for our master bedroom wall. This book would inspire me and my quilt guild to host a word quilt challenge! I love words on quilts! Am looking to do one for a raffle quilt that says Be Still.